Samsung has unveiled its highly-anticipated Galaxy Tab S with two variants: Galaxy Tab S 8.4 and Galaxy Tab S 10.5. As the name implies, they vary in terms of their display size, one with 8.4-inch display and the other with 10.5-inch display. These hot new items feature AMOLED panels to convey color-rich and crisp display. Samsung is enjoying massive success in the global market of smartphones being the biggest mobile manufacturer in the planet. However, it is extremely hard at work on the tablet category. Perhaps with the new line of tablets, Samsung may be able to grab a bigger share in the market (Q1 global tablet market share: 22 percent versus Apple’s 33 percent). Samsung gave more emphasis on the display quality of these newly unleashed tablets. Given the fact that more and more people relies on tablets for reading news and watching online videos, the Korean giant included Super AMOLED panels with 2560×1600 pixel resolution to the Tab S line. The Galaxy S-maker also brings in HD quality for Netflix and YouTube in order for users to take advantage of watching videos online. Likewise, Samsung is also building partnerships with top magazines companies like Conde Nast behind Voque, Glamour, Vanity Fair, Gold Digest, National Geographic and Marvel “to take digital magazine to the next level” with the new feature called Papergarden”. These new tablets were officially introduced during the New York City event and will join Samsung’s rising roster of tablets like the Galaxy Tab Pro and Galaxy Note Pro. Both will be available in two versions – WiFi and LTE. 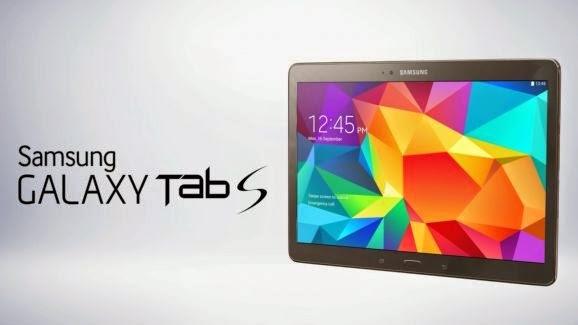 The price is at $399 for Samsung Galaxy Tab S 8.4 and $499 for its bigger brother.